Warm someone's heart with this bright floral arrangement, created in glowing shades of red and orange - and they'll know you've been thinking of them. Send this charming gift as a "get well" wish or as an everyday pick-me-up for a friend, family member or co-worker. 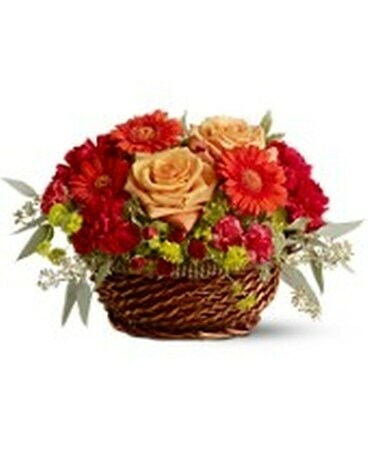 A mix of fresh flowers such as roses, gerberas and carnations – in shades of red and orange – is delivered in a basket.